"Many of the Missouri infantry, not being hardened to such severe marches, had dropped out of ranks, exhausted, and thus the command was reduced to about six hundred men. We had a cup of coffee and a hardtack for refreshment and then caught a little rest; but at one o'clock, on the morning of the 29th, we were ordered to fall in again … The night was so intensely dark that the men could not see one another and the trees beside the road formed almost an arch of black foliage overhead … finally a halt was ordered to wait for daylight. As soon as it was light enough to see, the march was resumed, and by ten o'clock [on September 29th] … the rear guard came galloping in, crying, “The Rebels are coming!” The news created temporary confusion, but when quiet was restored a few shots from the Fourteenth Iowa checked the enemy's advance. "The men at once forgot that they had marched forty miles and were tired. They started off like fresh troops and covered some five more miles when the enemy came up again. They were in larger numbers this time and were harder to check … The retreat had become exciting and there seemed good reason to fear for the final outcome … [When we were] within three miles of Leasburg and the railroad, the enemy again struck us in force." "As I remember, Co. I was in the rear of the infantry. The enemy skirmished a little with our cavalry; and meantime the infantry formed in line. But before long the enemy fell back and we took the road again and hurried on … we had gone some distance, keeping the farm on our right and a high bluff on our left, when the rear guard and the Confederates began skirmishing again. Near the farmhouse a large ravine came down to the road from the left, and here our whole infantry force formed in battle array ready for the enemy. Our gunners brought their cannon into position in the road and let the Confederates crowd in between the farm and the bluff. Then they sent shot after shot right down the road; and the enemy fell back in a hurry. Again we took up the line of march and were not again molested until we were within a mile or two of Leasburg, when the Confederates came up once more … [our] company it was formed in line of battle in a small field, with the enemy outside in the surrounding woods. The remainder of our infantry had also formed further up in the same field and a lively exchange of shots took place until the enemy fell back. Then we went into Leasburg on the double-quick." "The train … was loaded with ammunition, hardtack, bacon, picks, shovels and several barrels of whiskey,— just the articles of all others that we needed, excepting the whiskey. With the tools we made earthworks, which served splendidly for our protection; and as we dug and piled up the dirt, we ate hardtack and bacon, now and then snatching short naps of sleep." 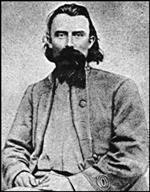 "I came up with the enemy yesterday at 11 a.m. and pursued them to Leasburg Station, on Pacific Railroad, thirty-five miles above Rolla, where during last night they fortified a strong position. I did not deem it advisable to attack them, and have to-day marched … twenty-four miles from the point for the junction of our forces. I will join you to-morrow night. The enemy numbered about 1,000 and six pieces of artillery." 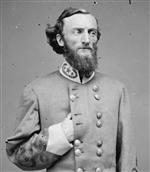 "At Caledonia I received orders to be in readiness in an hour to march with General Marmaduke in pursuit of General Ewing. All that night the chase went on, and early the next day Ewing's rear was gained and General Marmaduke, who was in advance, fought him until an hour before sunset, when my command, taking the lead, continued the fight until dark, making a heavy charge all along the line just as darkness shut out all vestiges of daylight. Night alone saved Ewing from capture, and we bivouacked upon the field of Leasburg supperless and rationless. The enemy spent their time in throwing up heavy fortifications, and it was considered best next morning not to renew the attack."